Cyclists who join us on opening day (May 3) can enter a raffle to win a $75 CVSR gift certificate good for any excursion or Bike Aboard pass! 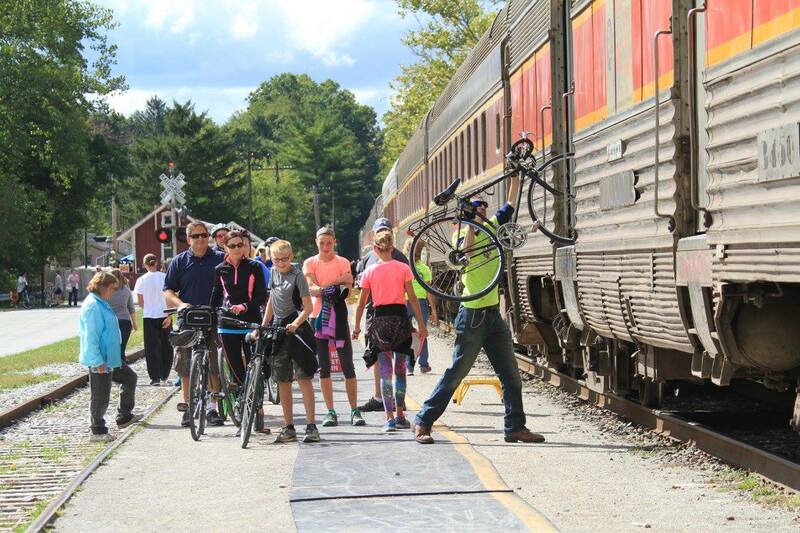 Take in the sights of Cuyahoga Valley National Park by bike! Our unique Bike Aboard program allows passengers to bring their bikes aboard the train, making for a fun day of exploring. Riders can choose to ride the train in one direction and bike back to their starting point or vice versa. Travel the Ohio & Erie Canal Towpath Trail where, from 1827 to 1913 mules pulled canal boats laden with passengers and goods up and down the historic Ohio & Erie Canal. Today’s trail follows the historic towpath as closely as possible, the exact route determined by historic maps and remnants of the trail itself. The train can be flagged down at any of our boarding stations by waving both arms over your head (one arm is just a friendly wave to the Engineer). The train will always leave on time from the stations, so please arrive to the station 10 minutes prior to departure time. 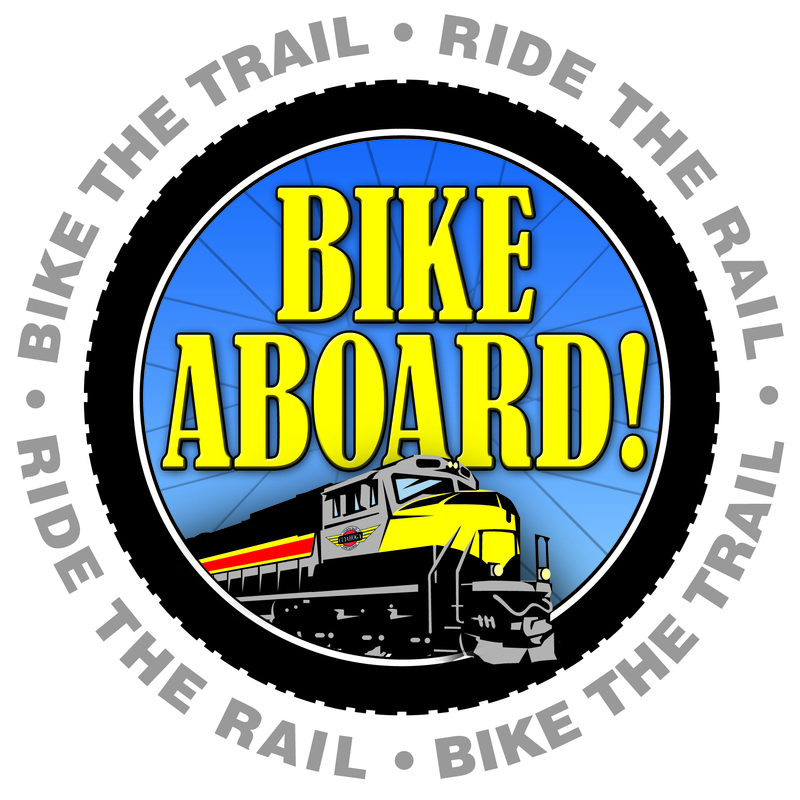 Bike Aboard will not be running on September 20-22 and 27-29 due to Steam in the Valley. The National Park Scenic excursion will also not be running. Bike Aboard is $5 per person and is paid upon boarding (ages 3 and older). Cash is preferred; exact change is appreciated. There is no pre-order available for Bike Aboard. For frequent riders, a Bike Aboard pass is available for $35 per person. A Bike Aboard pass allows riders to ride as many times as they wish and expires a year from the purchase date. Scroll below to purchase a pass. Bring your kayak aboard! Cost is $10 per kayak and $15 per double kayak. Bike Aboard is proudly sponsored by Cleveland Clinic and Century Cycles. Bike Aboard just got easier with the CVSR Train Tracker app! Download the app for free on Google Play or the Apple Store. This app allows you to follow the train, view the train’s current speed, heading and even listen to audio clips as you bike along. No bike? No problem! Rent a bike by the hour from Century Cycles in Peninsula, conveniently located near the towpath and Peninsula Depot. For cost and more information, click here.
. Visit the membership page to learn about other levels of membership.